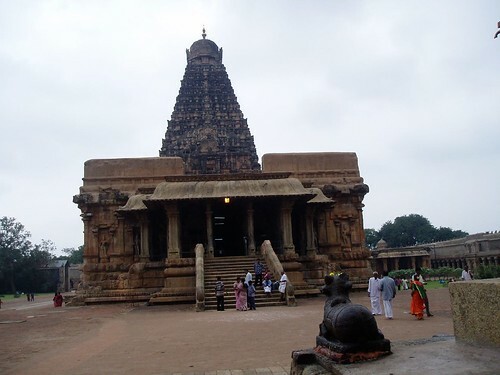 Tanjore Periya Kovil (after the local name for Shiva - Periya Aavudayar) or the mouthful Brihadeeswar temple is like none other temple you would typically expect to see in Tanjore district of Tamil Nadu. 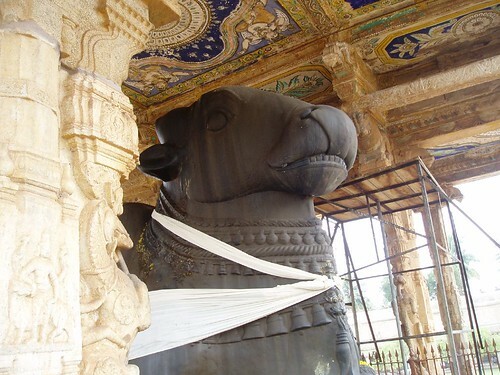 Built around 10th century, Brihadesswar temple is home to one of the largest Lingam (perhaps the largest in the world) and one of the largest Nandi . 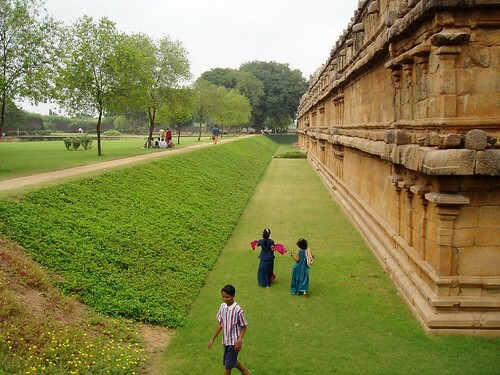 Unlike the other temples, this temple is one of the few worship places maintained by the Archaeological Society of India (ASI) and is part of UNESCO World Heritage Site. 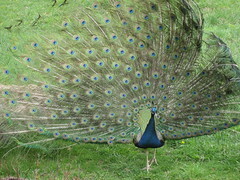 This is what we got to see as we got out of the car. We were told that, this is a monthly ritual in which the utsavar is taken around in the temple in a 'Veethi Ula'. 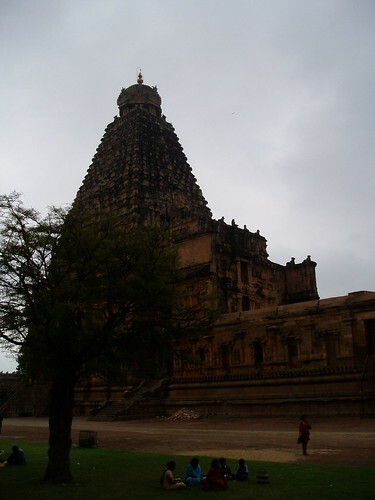 The main gopuram is truly impressive and an engineering marvel considering when it was built. 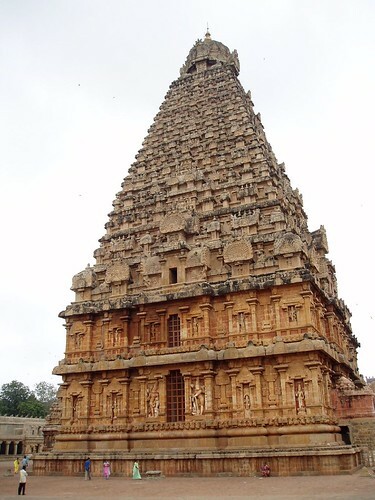 The legend goes that the shikaram at the top of the temple is made of a single stone weighing 80+ tonnes. A scaffolding (inclined plane made of sand) was built from a distance of 11 km to carry that stone to a height of 70m. The temple and the surroundings were well maintained. I think, it is because of the ASI is managing it and not by the Tamil Nadu Endowment board, which has poor track record and mired in corruption and political interference. 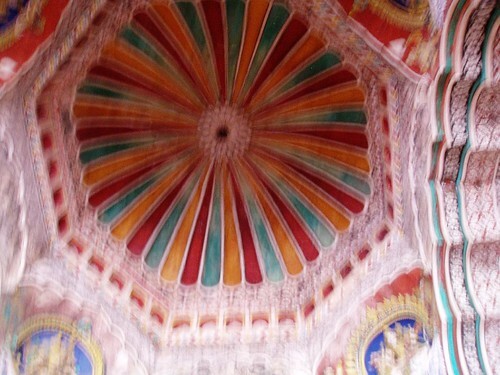 Inside Sarabhoji Maharaja Palace, which is very close to the temple is a also place to see in Tanjore. We went by road from Mayiladuthurai and it took us about 2+ hours to reach Periya Kovil. The traffic itself wasn't that bad during the early morning time, but remember to have working horns (louder the better) and solid brakes. The traffic on Indian roads can be crazy and it augurs well to slow down and be the one to give way to the other guy. We didn't stay in Tanjore, but I do understand it has some decent hotels. Lots of vegetarian Restaurants available, the food is good and cheap. Sarawathi Mahal - One of the oldest libraries, but need sufficient time to explore and enjoy. Sarabhoji Maharaja Palace: Impressive place, but needs maintenance. 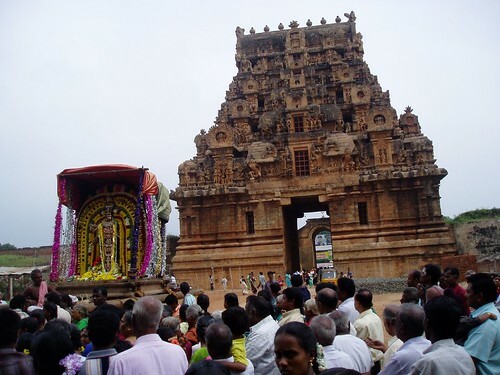 Thanks for your coverage of Thanjavoor temples. There are several like me who cannot visit such temples personally and thanks for bringing the temple to us. Ram, these photos make me want to go there. 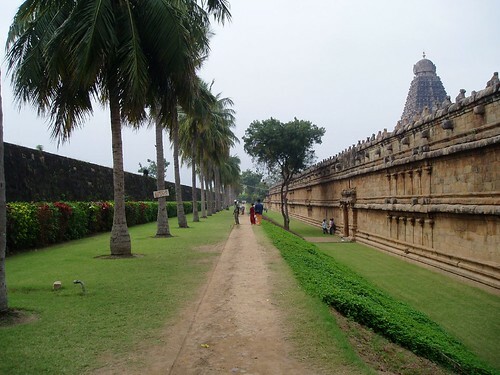 I'm thinking of one temple tour in Tamil Nadu. How far is Thanjavur from Chennai? Can it be done in one day? Thanks. Tanjore is about 350 kms from Chennai and cannot be done in a day..
From Chennai you can do Sholingar / Thiruvannamalam in a day.. I went to Sholingar last week and look for a post this week on that..
your travelogues are very interesting.